This Emerald diamond is 0.3 carat in weight, and comes with Excellent polish and Very Good symmetry, as verified from an independent gemological laboratory. The diamond is graded F in colour, and has a clarity grade of IF. The diamond's GIA grading report number is 2327504312, which will detail further its specifications and measurements, and will also come with the purchase of the stone. AUD 34,837 Excl. Duties / Taxes. This Emerald diamond is 1.76 carat in weight, and comes with Excellent polish and Very Good symmetry, as verified from an independent gemological laboratory. The diamond is graded D in colour, and has a clarity grade of IF. The diamond's GIA grading report number is 2106840117, which will detail further its specifications and measurements, and will also come with the purchase of the stone. AUD 60,090 Excl. Duties / Taxes. This Emerald diamond is 2.41 carat in weight, and comes with Excellent polish and Very Good symmetry, as verified from an independent gemological laboratory. The diamond is graded D in colour, and has a clarity grade of IF. The diamond's GIA grading report number is 5182880031, which will detail further its specifications and measurements, and will also come with the purchase of the stone. AUD 91,174 Excl. Duties / Taxes. This Sq. Emerald diamond is 3.01 carat in weight, and comes with Excellent polish and Very Good symmetry, as verified from an independent gemological laboratory. The diamond is graded D in colour, and has a clarity grade of IF. The diamond's GIA grading report number is 1309016320, which will detail further its specifications and measurements, and will also come with the purchase of the stone. AUD 15,188 Excl. Duties / Taxes. This Emerald diamond is 1.33 carat in weight, and comes with Very Good polish and Very Good symmetry, as verified from an independent gemological laboratory. The diamond is graded D in colour, and has a clarity grade of IF. The diamond's GIA grading report number is 2191902292, which will detail further its specifications and measurements, and will also come with the purchase of the stone. AUD 10,923 Excl. Duties / Taxes. This Emerald diamond is 1.2 carat in weight, and comes with Excellent polish and Excellent symmetry, as verified from an independent gemological laboratory. The diamond is graded F in colour, and has a clarity grade of IF. The diamond's GIA grading report number is 1319761095, which will detail further its specifications and measurements, and will also come with the purchase of the stone. This Emerald diamond is 1 carat in weight, and comes with Very Good polish and Good symmetry, as verified from an independent gemological laboratory. The diamond is graded H in colour, and has a clarity grade of IF. The diamond's GIA grading report number is 10292879, which will detail further its specifications and measurements, and will also come with the purchase of the stone. AUD 1,515 Excl. Duties / Taxes. This Emerald diamond is 0.4 carat in weight, and comes with Excellent polish and Excellent symmetry, as verified from an independent gemological laboratory. The diamond is graded D in colour, and has a clarity grade of IF. The diamond's GIA grading report number is 1315705558, which will detail further its specifications and measurements, and will also come with the purchase of the stone. AUD 10,761 Excl. Duties / Taxes. This Emerald diamond is 1.02 carat in weight, and comes with Excellent polish and Very Good symmetry, as verified from an independent gemological laboratory. The diamond is graded H in colour, and has a clarity grade of IF. The diamond's GIA grading report number is 2274701339, which will detail further its specifications and measurements, and will also come with the purchase of the stone. AUD 1,237 Excl. Duties / Taxes. This Emerald diamond is 0.42 carat in weight, and comes with Good polish and Good symmetry, as verified from an independent gemological laboratory. The diamond is graded H in colour, and has a clarity grade of IF. The diamond's GIA grading report number is 6305518591, which will detail further its specifications and measurements, and will also come with the purchase of the stone. This Emerald diamond is 0.4 carat in weight, and comes with Excellent polish and Very Good symmetry, as verified from an independent gemological laboratory. The diamond is graded D in colour, and has a clarity grade of IF. The diamond's GIA grading report number is 3295664158, which will detail further its specifications and measurements, and will also come with the purchase of the stone. AUD 7,540 Excl. Duties / Taxes. This Emerald diamond is 1.02 carat in weight, and comes with Very Good polish and Good symmetry, as verified from an independent gemological laboratory. The diamond is graded G in colour, and has a clarity grade of IF. The diamond's GIA grading report number is 11094125, which will detail further its specifications and measurements, and will also come with the purchase of the stone. AUD 12,741 Excl. Duties / Taxes. This Emerald diamond is 1.03 carat in weight, and comes with Excellent polish and Excellent symmetry, as verified from an independent gemological laboratory. The diamond is graded G in colour, and has a clarity grade of IF. The diamond's GIA grading report number is 1295524568, which will detail further its specifications and measurements, and will also come with the purchase of the stone. AUD 27,559 Excl. Duties / Taxes. This Emerald diamond is 2.14 carat in weight, and comes with Excellent polish and Very Good symmetry, as verified from an independent gemological laboratory. 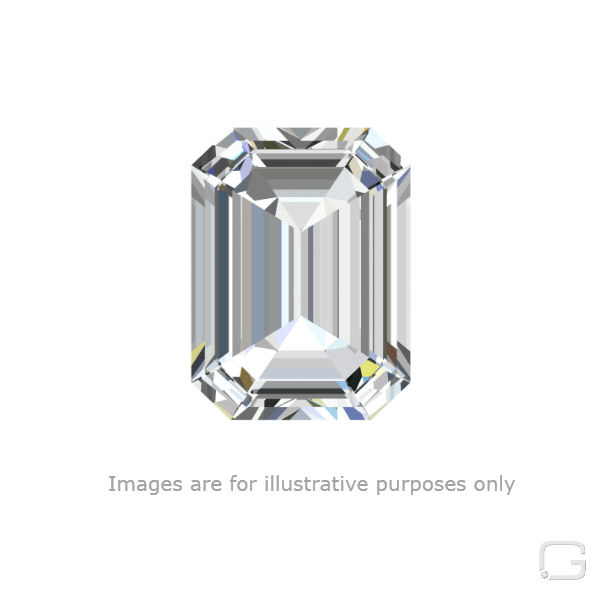 The diamond is graded G in colour, and has a clarity grade of IF. The diamond's GIA grading report number is 5306668698, which will detail further its specifications and measurements, and will also come with the purchase of the stone. AUD 10,416 Excl. Duties / Taxes. This Emerald diamond is 1.01 carat in weight, and comes with Excellent polish and Very Good symmetry, as verified from an independent gemological laboratory. The diamond is graded F in colour, and has a clarity grade of IF. The diamond's GIA grading report number is 1196957444, which will detail further its specifications and measurements, and will also come with the purchase of the stone. AUD 1,445 Excl. Duties / Taxes. This Emerald diamond is 0.4 carat in weight, and comes with Very Good polish and Excellent symmetry, as verified from an independent gemological laboratory. The diamond is graded F in colour, and has a clarity grade of IF. The diamond's GIA grading report number is 2326295687, which will detail further its specifications and measurements, and will also come with the purchase of the stone. This Emerald diamond is 0.65 carat in weight, and comes with Very Good polish and Very Good symmetry, as verified from an independent gemological laboratory. The diamond is graded J in colour, and has a clarity grade of IF. The diamond's GIA grading report number is 1125258849, which will detail further its specifications and measurements, and will also come with the purchase of the stone. AUD 1,487 Excl. Duties / Taxes. This Emerald diamond is 0.41 carat in weight, and comes with Excellent polish and Excellent symmetry, as verified from an independent gemological laboratory. The diamond is graded F in colour, and has a clarity grade of IF. The diamond's GIA grading report number is 5326074392, which will detail further its specifications and measurements, and will also come with the purchase of the stone. AUD 1,546 Excl. Duties / Taxes. This Emerald diamond is 0.43 carat in weight, and comes with Excellent polish and Excellent symmetry, as verified from an independent gemological laboratory. The diamond is graded G in colour, and has a clarity grade of IF. The diamond's GIA grading report number is 2326259821, which will detail further its specifications and measurements, and will also come with the purchase of the stone. This Emerald diamond is 0.5 carat in weight, and comes with Excellent polish and Excellent symmetry, as verified from an independent gemological laboratory. The diamond is graded D in colour, and has a clarity grade of IF. The diamond's GIA grading report number is 6312729366, which will detail further its specifications and measurements, and will also come with the purchase of the stone. This Emerald diamond is 0.34 carat in weight, and comes with Very Good polish and Very Good symmetry, as verified from an independent gemological laboratory. The diamond is graded F in colour, and has a clarity grade of IF. The diamond's GIA grading report number is 1305925111, which will detail further its specifications and measurements, and will also come with the purchase of the stone. This Emerald diamond is 0.54 carat in weight, and comes with Excellent polish and Very Good symmetry, as verified from an independent gemological laboratory. The diamond is graded D in colour, and has a clarity grade of IF. The diamond's GIA grading report number is 2193997479, which will detail further its specifications and measurements, and will also come with the purchase of the stone.